The Johnny's Jimusho talent agency, which was established by Johnny Kitagawa back in the early 1960's, has dominated the boy-band market in the four decades since. All the top male groups on Japanese TV today are members of his stable: SMAP, Tokio, Kinki Kids and V6, while Arashi and KAT-TUN are among the up-and-coming younger generation. Johnny's Jimusho - or Johnny and Associates as it is officially called in English - started in 1963 when Kitagawa launched his first group, not surprisingly named Johnnies. They were followed by the hugely successful foursome, the Four Leaves (who recently announced a comeback some 23 years after they broke up in 1978). Kitagawa built on the success of this "idol" quartet and churned out one group after another over the decades. The Golden Age of the idols was in the 1980's, and Johnny's created the biggest of all the stars: the Tanokin Trio, Ninja, Shibugakitai and Hikaru Genji. Two members of the Tanokin Trio, Kondo Masahiko (later a racing car driver who has driven in the 24-hour race at Le Mans) and Tahara Toshihiko went on to hugely successful solo singing careers with over a dozen No.1 hits each, while Motoki Masahiro (usually known as Mokkun, left) of Shibugakitai has become a respected actor. Hikaru Genji became the first group to start off their career with eight straight No.1's and in 1988, they had the three top-selling singles of the year, a rare feat. Their roller-skating theatrics was a crowd-pleasing idea that Kitagawa said was inspired by the stage shows of Alice Cooper. 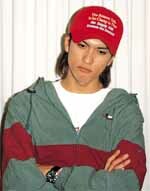 The 1990's saw former Hikaru Genji's backing skateboarders SMAP reach the very summit of the Japanese entertainment world. As the idol boom had faded, they had struggled to achieve real success as just a singing group. So Johnny's turned them into multimedia talents. Within a couple of years, they were quite simply everywhere. Their own regular TV and radio shows (reminiscent of the Monkees), commercials, best-selling albums, dramatic roles, magazine covers and more kept them in the spotlight and at the top of the popularity rankings. Kimura Takuya (left) became the dream boy for a whole generation of schoolgirls and continues to be voted Japan's Sexiest Man. His marriage to Kudo Shizuka, herself a former idol, was one of the biggest stories of 2000. Ironically there was talk of SMAP breaking away from Johnny's until member Inagaki Goro got himself arrested for turning a simple parking violation into an attempted hit and run in August 2001. While SMAP have long been the crown princes of Japanese entertainment, other groups in their stable have built up huge followings, too. Tokio and V6 are in the SMAP mould and the same age bracket. Tokio member Nagase Tomoya (left) achieved new heights of fame when he was dicovered to be the love interest of pop diva Hamasaki Ayumi. Kinki Kids, made up of Domoto Tsuyoshi and Domoto Koichi (they're not related), started out as comedians but have become a best-selling singing duo who have an amazing run of over 20 No.1 singles in a row. Arashi is a splinter group from the sprawling membership of Johnny's Junior. All of the groups have their own regular TV shows and sell out arenas across the country. But why the Johnny's focus only on male groups? Well, the man himself once claimed that they're just easier to handle. But the exact meaning of "handle" has been the subject of great speculation over the years. In 1988 Kita Koji, a member of the Four Leaves, wrote a tell-all diary in which he described being molested by Kitagawa and other idols. Similar claims were made in another book published in 1996. One story has Inagaki Goro hardly able to do his dance routines after enduring the romantic advances of Kitagawa. Though they're widely believed to be true, the squeaky clean image of pretty boy-next-door groups has hardly been dented by these accusations. This is perhaps associated with the fact that many young Japanese women are also fans of bishonen manga, comic books in which pretty young boys have romantic encounters. Also Johnny's Jimusho has been so hugely powerful for the last couple of decades that the media dares not kill this goose that has laid so many golden eggs.